Where would you go to find a pair of the latest Nike running shoes, a sequined purse for under 20 dollars, and a spiral potato all in one street? There is only one place in Seoul. Seoul has already received ten million tourists this year, which compares markedly with 9.8 million visitors for all of last year. Hallyu and increased global recognition have made Korea an increasingly appealing destination for more and more tourists around the world. Where do they all especially like to go in Seoul? According to a recent survey by the Korea Tourism Organization, the answer is Myeongdong in downtown Seoul. The survey targeted 12,000 tourists departing Korea, and 55.3% answered that their major tourist destination was Myeongdong. One of the all-time favorite shopping districts for Koreans has become a popular goto place among tourists as well. Every day, some 500,000 people pass through Myeongdong. 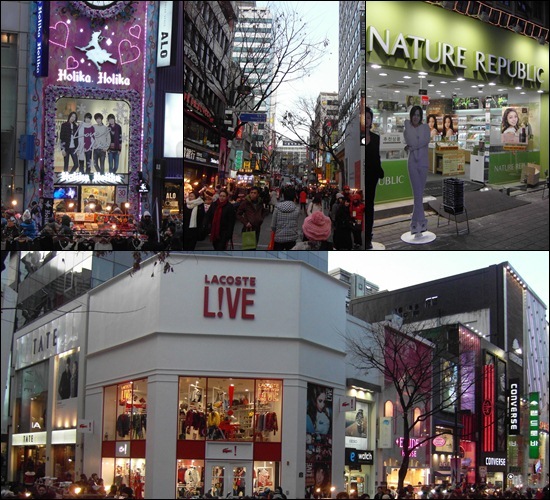 Myeongdong is the most popular shopping area for Seoulites, and it has truly become international as there are now more foreigners than local along the streets. The area stretches from Shinsegae Department Store to Lotte Department Store and along Cheonggyecheon Stream to Myeongdong Subway Station.The heart of Myeongdong is the two main streets that intersect at the center of the block. One begins at Myeongdong Station and the other at Lotte Department Store. The streets are lined cheek-by-jowl with fashion brand stores, cosmetics shops, restaurants, and cafes. From midday when all the shops are open until the late hours of the night when food carts and neon shop signs light up the alleys, the streets of Myeongdong are full of life and buzz from excited shoppers. Myeongdong is a wildly popular shopping district today, and the area’s history over the last 100 years is extremely interesting. During the Joseon era up until the 19th century, Myeongdong was a quiet residential area. When the country opened its doors to the world in 1885, the British, Chinese, and Japanese came to Korea and settled down in the nearby Chungmuro and Euljiro areas.Myeongdong Cathedral, which is the seat of the Archbishop of Seoul, was built in 1898. It became a community landmark and is still the center of Catholicism in Korea. During the Japanese colonial period in the early 1900s, major institutions and commercial buildings such as the Bank of Korea, the Japanese Consulate, and Shinsegae Department Store were built and the area became the commercial center of Seoul. After the Korean War and into the 1960s, the economy boomed and the area flourished as the city was redeveloped. College students assembled in Myeongdong as it became a place to enjoy pop music and dancing, and young women came to shop at the upscale shops and boutiques. Myeongdong remains the mecca for the young and trendy to this day, especially since the area was designated as a special Tourism Promotion Area in 2000. The charm of Myeongdong that makes it stand out from other shopping areas in Seoul, is the cluster of very different shops, ranging from mid-priced to high-priced retail stores to international brand outlets. Department stores offer the high-end global brands, and Dongdaemun is the place to go for inexpensive trendy clothes. Myeongdong is where you can find both. The main streets are lined with individual shops for global sports brands, Korean cosmetics shops, and international retailers like Zara and H&M. And just along the next alley, there are trendy boutiques filled with affordable clothes and accessories. The densely packed area jammed with different shops is a great attraction for ambling tourists and busy shoppers on the go. One of the most popular items on Japanese and Chinese shoppers’ lists is Korean cosmetics. As the popularity of Korean dramas and K-pop has grown in neighboring Asian countries, the fashion and makeup style of Korean actresses has had a great effect on many ardent fans, and they are naturally seeking the same Korean cosmetic products that the stars are using. Nearly every single local cosmetic brand operates a shop in Myeongdong complete with bilingual staff fluent in English, Japanese, or Chinese. Shopping in Myeongdong couldn’t be any easier.Of course a satisfying shopping spree wouldn’t be complete without a delicious meal. After 5 o’clock in the afternoon, street vendors pull up their carts along the two main streets to sell local street food like tteokbokki (spicy rice cakes), fried fish cakes, and skewered sausages. One of Myeongdong’s most famous street foods is the spiral potato made of a potato sliced, skewered, and fried in the shape of a spiral. More and more visitors are coming to Myeongdong every year, and the narrow streets are becoming more congested. The Seoul City Government decided to close the area off to all cars next year as part of its efforts to create a pedestrian-friendly environment. Cars still drive through the main streets during the day, but the entire area will soon become a pedestrian-only zone. That’s just one more factor that will make shopping in Myeongdong more enjoyable.